Only when our faith is aligned with the will of our Heavenly Father will we be empowered to receive the blessings we seek. That was the most beautiful rendition of a magnificent song, “A Poor Wayfaring Man of Grief,” which was the favorite of the Prophet Joseph and his brother Hyrum. What a beautiful performance from the choir and orchestra. I pray I may have the Spirit of the Lord with me that has been with us during our conference, that I may say those things that will be beneficial to members of the Church and those who are not members. I feel very humble in this assignment. There are those who can teach us regarding faith if we will but open our hearts and our minds. One such person is a woman whose husband had died. Left alone to raise her son, she had tried to find ways of supporting herself, but she lived in a time of terrible famine. Food was scarce and many were perishing because of hunger. As available food diminished, so did the woman’s chance of surviving. Every day, she watched helplessly as her meager supply of food decreased. Hoping for relief but finding none, the woman finally realized the day had come when she had only enough food for one last meal. She did not know that the man before her was the prophet Elijah, sent to her by the Lord. What this prophet told her next may seem surprising to those today who do not understand the principle of faith. In the wisdom of our day, the prophet’s request may seem unfair and selfish. In the wisdom of our day, the widow’s response may appear foolish and unwise. That is largely because we often learn to make decisions based upon what we see. We make decisions based on the evidence before us and what appears to be in our immediate best interest. Too often today, we do not rely on faith so much as on our own ability to reason and solve problems. If we become ill, modern medicine can work healing miracles. We can travel great distances in a short time. We have at our fingertips information that 500 years ago would have made the poorest man a prince. “The just shall live by faith,”7 we are told in holy writ. I ask again, What is faith? Faith exists when absolute confidence in that which we cannot see combines with action that is in absolute conformity to the will of our Heavenly Father. Without all three﻿—first, absolute confidence; second, action; and third, absolute conformity﻿—without these three all we have is a counterfeit, a weak and watered-down faith. Let me discuss each of these three imperatives of faith. First, we must have confidence in that which we cannot see. When Thomas finally felt the prints of the nails and thrust his hand into the side of the resurrected Savior, he confessed that he, at last, believed. Brothers and sisters, when these prophetic words were uttered, some faithful members of the Church mustered their faith and heeded the counsel of the prophet. They are profoundly grateful today that they did. Others perhaps believed that what the prophet said was true but lacked faith, even as small as a grain of mustard seed. Consequently, some have suffered financial, personal, and family distress. Third, one’s faith should be consistent with the will of our Heavenly Father, including His laws of nature. The sparrow flying into a hurricane may believe that he can successfully navigate the storm, but the unforgiving natural law will convince him otherwise in the end. Are we wiser than the sparrow? Often what passes for faith in this world is little more than gullibility. It is distressing to see how eager some people are to embrace fads and theories while rejecting or giving less credence and attention to the everlasting principles of the gospel of Jesus Christ. It is distressing how eagerly some rush into foolish or unethical behavior, believing that God will somehow deliver them from the inevitable tragic consequences of their actions. They even go so far as to ask for the blessings of heaven, knowing in their hearts that what they do is contrary to the will of our Father in Heaven. How do we know when our faith conforms to the will of our Heavenly Father and He approves of that which we seek? We must know the word of God. One of the reasons we immerse ourselves in the scriptures is to know of Heavenly Father’s dealings with man from the beginning. If the desires of our heart are contrary to scripture, then we should not pursue them further. Next, we must heed the counsel of latter-day prophets as they give inspired instruction. Truly understood and properly practiced, faith is one of the grand and glorious powers of eternity. It is a force powerful beyond our comprehension. “Through faith … the worlds were framed by the word of God.”13 Through faith, waters are parted, the sick healed, the wicked silenced, and salvation made possible. Our faith is the foundation upon which all our spiritual lives rest. It should be the most important resource of our lives. Faith is not so much something we believe; faith is something we live. Then I’ll suggest they read the scriptures daily and recommend they kneel down every morning and night and pray with their father and mother and have personal prayers. I admonish them to go to their sacrament meetings. I admonish them always to keep themselves pure and clean, always attend their meetings, and finally, among other things, always strive to be sensitive to the whisperings of the Lord. If we approach them with love rather than reproach, we will find that the faith of our grandchildren will increase as a result of the influence and testimony of someone who loves the Savior and His divine Church. Sometimes the world appears dark. Sometimes our faith is tried. Sometimes we feel that the heavens are closed against us. Yet we should not despair. We should never abandon our faith. We should not lose hope. A few years ago, I began to notice that things around me were beginning to darken. It troubled me because simple things like reading the print in my scriptures were becoming more difficult. I wondered what had happened to the quality of the lightbulbs and wondered why manufacturers today couldn’t make things like they had in years past. I replaced the bulbs with brighter ones. They, too, became dim. I blamed the poor design of the lamps and bulbs. I even questioned whether the brightness of the sun was fading before the thought occurred to me that the problem might not be with the amount of light in the room﻿—the problem might be with my own eyes. Shortly thereafter, I went to an ophthalmologist who assured me that the world was not going dark at all. A cataract on my eye was the reason the light seemed to be fading. This certainly gives you my age. I placed my faith in the capable hands of this trained specialist, the cataract was removed, and behold, light again flooded my life! The light had never diminished; only my capacity to see the light had been lessened. This taught me a profound truth. Often when the world seems dark, when the heavens seem distant, we seek to blame everything around us, when the real cause of the darkness may be a lack of faith within ourselves. Be of good cheer. Have faith and confidence. The Lord will not forsake you. Our Heavenly Father is a powerful, moving, directing being. While we may, at times, bear burdens of sorrow, pain, and grief; while we may struggle to understand trials of faith we are called to pass through; while life may seem dark and dreary﻿—through faith, we have absolute confidence that a loving Heavenly Father is at our side. 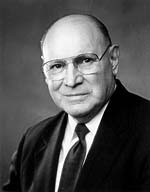 I testify that through our prophet, seer, and revelator, President Gordon B. Hinckley, our Lord and Savior, Jesus Christ, speaks to all of us today. I testify the gospel was restored in its fulness through the Prophet Joseph Smith. Faith, an eternal power, is a gift from our Heavenly Father for all mankind. To this eternal truth I bear my personal witness in the name of Jesus Christ, amen. Webster’s Ninth New Collegiate Dictionary (1984), “Faith,” 446. Heb. 11:1; see also Heb. 11:2–40; Ether 12:7–22. “To the Boys and to the Men,” Ensign, Nov. 1998, 53; Liahona, Jan. 1999, 65.